Who's afraid of the Big Bad Terrorist? On Friday, the UK government raised its terror threat from "substantial" to "severe" as Home Secretary Theresa May warned of threats from jihadists from Iraq and Syria. Global stock markets sold off initially on the news, but recovered later in the day. The answer is an emphatic "yes". As investors and traders, we should be focusing on fundamentals. Aside from the tragedy of injury and loss of lives, market participants should be asking what impact a terrorist attack would have on the growth outlook and interest rates. In most cases, the answer is "not very much." Consider these three examples of how the market reacted to past terrorist events. Here is the market reaction to the Boston Marathon bombing. Blink and you would have missed the disruption. Here is the market reaction of the FTSE 100 to the July 7 London bombings. Again, blink and you would have missed it. The bombings occurred three days before general elections in which incumbent José María Aznar's PP was defeated. Immediately after the bombing, leaders of the PP claimed evidence indicating the Basque separatist organization, ETA (Euskadi Ta Askatasuna) was responsible for the bombings, while Islamist responsibility would have had the opposite effect as it would have been seen as a consequence of the PP government taking Spain into the Iraq War, a policy extremely unpopular with Spaniards. Nationwide demonstrations and protests followed the attacks. The predominant view among political analysts is that the Aznar administration lost the general elections as a result of the handling and representation of the terrorist attacks, rather than because of the bombings per se. The moral of the story: Don't just react to headlines, focus on fundamentals. What if the Horatio Alger's story hero is named Rajiv? In this Age of Piketty, there have been more and more writing about the issue of income and wealth inequality. Three articles particularly resonated with me. The first was a piece from Richard Reeves of the Brookings Institute called Saving Horatio Alger: Equality, Opportunity and the American Dream. Lack of upward mobility is souring the national mood. As horizons shrink, anger rises. The political right has done a better job, so far, of converting frustration into political gain, by successfully—if implausibly—laying the blame for many of America’s woes at the door of "Big Government". Much of the political energy on the left has been directed against the highest earners—the top 1 percent of the income distribution. But while Occupy Wall Street generated plenty of headlines, it has produced precious few votes, and only a trivial change in the tax system: since 2013, married couples making more than $450,000 a year have had to pay just an extra nickel of tax on each dollar above that level. 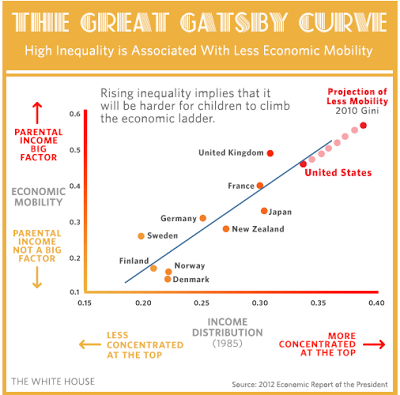 Take one standard indicator of mobility: the likelihood that children will, as adults, ascend to a higher rung on the income ladder than their parents. In a completely mobile, fluid society, a child raised on the bottom rung of the income ladder (usually defined as the bottom fifth of the distribution) would theoretically have as good a chance as any of making it to the top, and no greater risk of remaining trapped at the bottom. But the U.S. suffers from a high degree of intergenerational "stickiness" at the bottom of the income distribution. Children born on the bottom rung have a four in 10 chance of remaining stuck there in adulthood (between 36 percent and 43 percent, depending on the dataset), and a very slim chance (between 4 percent and 10 percent) of making it to the top. On the political left, there are plenty of people who think it is time to consign Horatio Alger to the dustbin of history. For them, the Alger myth is little more than a cultural conjuring trick, providing an illusion of opportunity to distract the masses from gross inequalities of income and wealth. It can also act as a convenient untruth for the elite, who can rest assured of their intrinsic superiority: “Born on third base … thinking they hit a triple,” in football coach Barry Switzer’s vivid phrase. But abandoning Alger—giving up on the American Dream—is not an option. While Bellamy and Piketty provide rich seams of ideas to mine, there is no prospect of a Euro-egalitarian turn in American politics. The American body politic would simply reject a graft of European-style social democracy. It’s pointless for progressives to get frustrated about this. Attachment to the ideal of equal opportunity is not a blind spot in the vision of voters. Americans do have strong egalitarian instincts, but they go hand-in-hand with a fierce commitment to individualism. The ideal of merit-fueled mobility is a fixed feature of American politics and ideology. It comes, almost literally, with the territory. Even if it were possible to retire the Alger myth, it would be a mistake. The national commitment to the principles of natural equality, opportunity, and upward mobility is an American strength. Only a politics that goes with this American grain stands any chance of creating a more equal nation. Hanauer`s solution is to pay Americans more, starting with a minimum wage increase. He believes that a better paid Middle America would have more money to spend and therefore corporate income, leading to a virtuous cycle of growth. If there’s one political idea most people agree on these days, it’s the rule of law. We argue endlessly about income inequality, wealth inequality, or inequality of opportunity, but we take it as given that equality under the law is a prerequisite for a just society. And the consequences of private law are dire. The original system of French privilege was one of the main causes of that country’s bloody, chaotic revolution. Now here’s the problem: The U.S. is looking more and more like it has a real privilege system. We are enforcing laws differently based on race, but also based on class. This is un-American, and it has got to stop. First, there is race privilege. The tragic shooting of an unarmed black teenager by a police officer in Ferguson, Missouri, has put this issue front and center, but the facts bear repeating. Our police officers enforce the law differently for different races. They arrest a much higher percentage of black people for using drugs, even though blacks and whites use illegal drugs at about the same rates and whites use the most harmful drugs -- cocaine and heroin -- at higher rates. That is an injustice. Our courts are no less of a problem. Blacks are 30 percent more likely to be thrown in prison than whites who were convicted of the same crime. Furthermore, our Constitution guarantees citizens the right to a trial by a jury of their peers, but many black defendants are prosecuted by all-white juries, which are significantly more likely to return a guilty verdict against blacks. Finally, racial profiling is so rampant that black Americans who have committed no crimes at all have to live in constant fear of getting stopped by the cops. White Americans don't have to live with this fear. White Americans can be complacent about racial disparities in law enforcement, thinking that at least they themselves are safe. Except that in modern America, the law now seems to be different for people of different income levels as well. Felony convictions have some pretty serious job implications for someone in Mr. Erzinger's profession, and that entered into it," [prosecutor] Hurlbert said. "When you're talking about restitution, you don't want to take away his ability to pay. In addition to the story of Martin Erzinger, Noah Smith had a number of other examples of how the rich got off easily with a slap on the wrist from the justice system when faced with serious offences. The article is well reading in its entirety. The main point is: Class systems choke off growth. Reeves, Hanauer and Smith all make good points about inequality in America. Equality of opportunity is becoming a barrier to the American Dream that anyone can succeed. Should that Dream and social consensus shatter, the cultural dynamics of growth in the United States would be changed forever. However, this kind of thinking about inequality models American equality as a closed system. The United States is part of the world - and the nature of global inequality has been changing. In a landmark study, Branko Milanovic of the World Bank showed how global inequality has been changing. The chart below shows who won and lost in the inequality race globally. The x-axis on the bottom splits the world population from the poorest on the left in subsistence economies to the richest on the right, while the y-axis shows the real income growth in PPP terms between 1988 and 2008. Milanovic went on to show that the country that you were born matters a lot more now than the social class that you were born into. In 1988 to 2008 30-year interval, the winners in the inequality race were the middle class in emerging economies, because of the effects of globalization, and the very rich, who engineered the globalization revolution. The losers were the very poor in subsistence economies, who weren't able to benefit from and the middle class in developed economies, who did not receive the benefits of the productivity gains in the last few decades. The latter represents the disaffected group that Reeves and Hanauer wrote about. So, is the American Dream still alive? Well sort of. It got globalized and the winners of the American Dream are not likely named Joe, but Rajiv. As to the question of whether this represents a bug, or a feature, of economic policy, that question is way beyond my pay grade. The Alliance is backing a ballot measure in the state this November that would require background checks for all gun purchases in the state, including those made at gun shows and online. The measure is opposed by a local group known as Protect Our Gun Rights, which has raised $1.1 million and has its own measure on the ballot to try to block background checks. I understand the history of the Bill and Melinda Gates Foundation is to take incremental steps to better the world with small but high impact contributions to worthy causes. The tragedy of gun violence in America is deplorable. However, your latest contribution marking an approach towards gun control political advocacy, regardless of your intent, cannot be regarded as a high impact act given the entrench gun culture in American society. Instead, might I suggest a Third Way of achieving your goals of a safer America while achieving a political consensus about gun ownership (see my previous post Is more government the answer?). There is no question that gun ownership involves risk, as shown by most recent incident of the nine-year-old accidentally killing her instructor, Gun control advocates believe that it introduces too much risk into American society, while gun owners believe that the benefits of gun ownership and the right to self-protection far outweigh the risks. Driving cars is virtually a universal right in America. Nevertheless, drivers have responsibilities in the operation of a vehicle and laws requiring liability insurance. If we apply the same principles used for cars to guns and allow the market to price the risk of gun ownership, it is a proposal that could see strong bipartisan support from both sides of the gun control debate. That would fit with the profile of a low cost, but high impact initiative in the tradition of the Bill and Melinda Gates Foundation of making the world a better place. Ho hum! Another month, another miss on core capital goods orders release. I have been writing about this topic for several months (see What equity bulls need for the next phase, CapEx: Still waiting for Godot and Financial engineering as a CapEx substitute). In the current mid-cycle phase of the economic expansion, companies typically ramp up their capital expenditures, which seems to have gone MIA this time. So where is the CapEx? Credit conditions are easy and capacity utilization is creeping up, so this is a perfect time for a CapEx revival. A WSJ article recently blared a headline indicating that US bond issuance was nearing $1 trillion on a YTD basis. Where did all that borrowing go? Investors and analysts say companies are raising funds partly with an eye to investing in fresh projects as the U.S. economy gains pace, a move that can further help along economic growth. Acquisitions have about doubled in the U.S. from last year to a recent $1.1 trillion, and U.S. bond sales earmarked for capital spending—purchases or upgrades of long-lived assets such as plant and equipment—have risen 90% from a year earlier to $40 billion, Dealogic said. Much of the cash is being used to refinance existing debt, being sent back to shareholders as dividend payments and share buybacks, or banked in the corporate treasury as executives consider how to potentially deploy funds as the economy expands. In that context, $40 billion for capital expenditures pales in comparison. Add Jim Chanos' to the number of voices worried that American companies are running out of gas and in need of real consumer demand to create revenue. In an interview with Bloomberg's Masters in Business, hosted by Barry Ritholtz, Chanos explained how corporate buybacks were less a sign of strength and more a cry for help from American companies. He said: "What worries me is that corporate America in aggregate, has pre-tax returns on capital in the mid to high teens. The long-term expected rate of the equity markets, is roughly half that. And when corporations embarked on massive buybacks across all industries and all companies, in effect these CEOs are buying the stock market. So what they’re telling you then, is unequivocally that they think that either they’re happy to earn the stock market rate of return or maybe something hopefully better. Or their rate of return on the margin of any new capital project is much much lower, in fact half or less of what is stated. And that does not bode well for the future of profits, or for the quality of earnings reported as current profits." Chanos says that corporate balance sheets are looking healthier because analysts aren't deducting acquisitions from a company's cash flow as they should. Is Chanos right? Is Corporate America substituting financial engineering for actual capital spending, which should be occurring during this phase of the economic expansion? Are there insufficient number of capital projects that beat their WACC (weighted average cost of capital) to warrant investment? I have no idea. What I do know is that Mr. Market is reacting to these developments. The chart below of the performances of the capital goods intensive Industrial sector, cap weighted or equal weighted (which reduces the effects of heavyweight GE), is rolling over relative to the SPX. Should this trend in listless capital spending continue, it will hollow out Corporate America and stunt its long-term competitiveness. This is the second part of a two-part comment about the US equity market. Yesterday's comment (The easy money has been made) was based on technical analysis, while this comment has a top-down macro orientation. I welcome any comments about the new format at cam at hbhinvestments dot com. 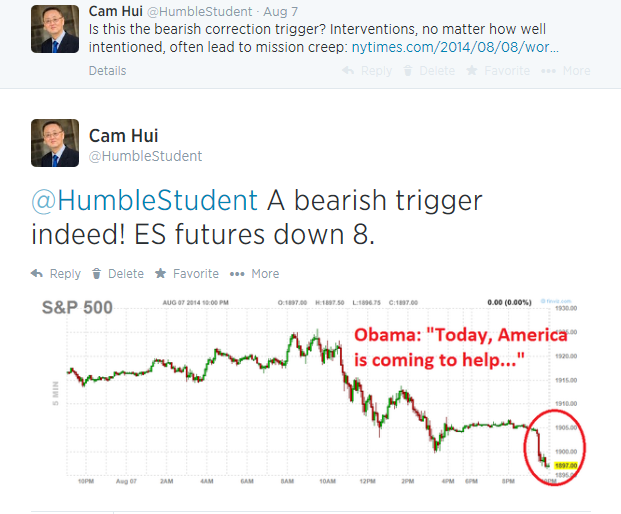 You can also follow any updates on Twitter at @humblestudent, or subscribe to my blog posts by email here. Even though I remain relatively bullish on US equities (see A tradable bottom? and The easy money has been made), it's the job of every good investor to think look skeptically at his own views and examine the other side of the coin. When I do, here is the bearish scenario that keeps me awake at night. Employers in the U.S. are creating jobs at the fastest pace since the late 1990s and the economy finally looks ready to expand at a healthy rate. But sluggish growth in France, Italy, Russia, Brazil and China suggests that the old truism, "When the U.S. sneezes, the rest of the world catches a cold," may need to be flipped. Maybe the rest of the world will sneeze this time, and the U.S. will get sick. His grandfather, Jerome, didn't just call the Great Crash of 1929, he sold all his stock and liquidated his wholesale goods business in anticipation of it. Immediately after World War II, when many experts thought the U.S. was sure to fall into another depression, his father, Jay, accurately predicted a rapid expansion instead. In late 1999, his uncle, Leon Levy, a hedge fund manager and collector of antiquities, invited this reporter into his office, pointed to a bust of a rich Roman near his door and mused on the fleeting nature of fortune. He then predicted a new generation of wealthy would be laid low soon in a coming dot-com crash. Those stocks began their long dive a few months later. Levy says the U.S. is in decent shape. Like most economists, he's not worried about the nation's 2.9 percent drop in economic output in the first quarter, attributing it to harsh winter weather. He expects growth to return, but not for long, as a recession in either Europe or emerging markets spreads to the U.S.
Levy says the U.S. is more vulnerable to troubles abroad than people realize. Exports contributed 14 percent of U.S. economic output last year, up from 9 percent in 2002. That sounds like a good development, but it also makes the country more dependent on global growth, which, in turn, relies more on emerging markets. Those markets accounted for 50 percent of global output last year, up from 38 percent in 2002. Indeed, the weakness in Europe and China are evident to see. The latest global PMIs show that while the US and Japan are accelerating, Europe and China are slowing. The alternative (scenario) is a stalling of reforms, with either major intervention to weaken the renminbi or an investment binge. The result is likely to be a re-run, on a greater scale, of the selling of long-dated Treasuries witnessed in 2012. Yields could rise 10bp. These outcomes would slow but not derail the US recovery – yields rose by almost a percentage point in the second half of 2013. Moreover, these scenarios assume all other things are equal. But they are not. Renminbi devaluation and higher US yields would be a lethal combination for the eurozone . Most European countries have modestly improved their trade positions with China thanks to stronger German capital exports and soft consumer spending, which has capped imports. But a much weaker renminbi would reverse the trend, thus subtracting from growth. The eurozone’s peripheral economies would be hurt most because they have a larger export share of lower value-added manufactures and are more likely to compete with China. But Germany’s export-led growth would also suffer if China reduced its excessive reliance on investment. In addition to the currency effect, a rise in US yields transmitted to the eurozone would represent just the “unintended tightening of monetary conditions” that Mario Draghi, European Central Bank president, has identified as one of three contingencies that would warrant a monetary policy response. The 17.5pc rise in exports to Europe is probably real (since that data is harder to fiddle). Far from being healthy, it is alarming. 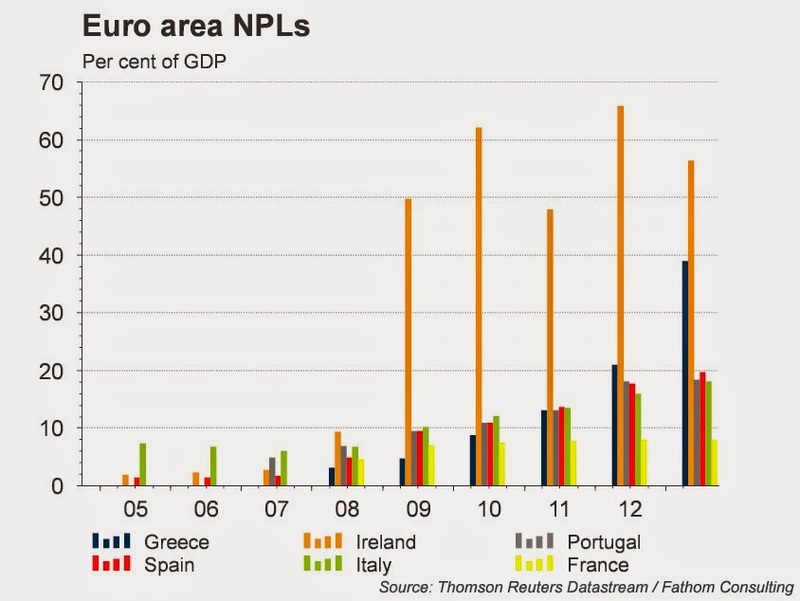 Euroland is clearly not booming. 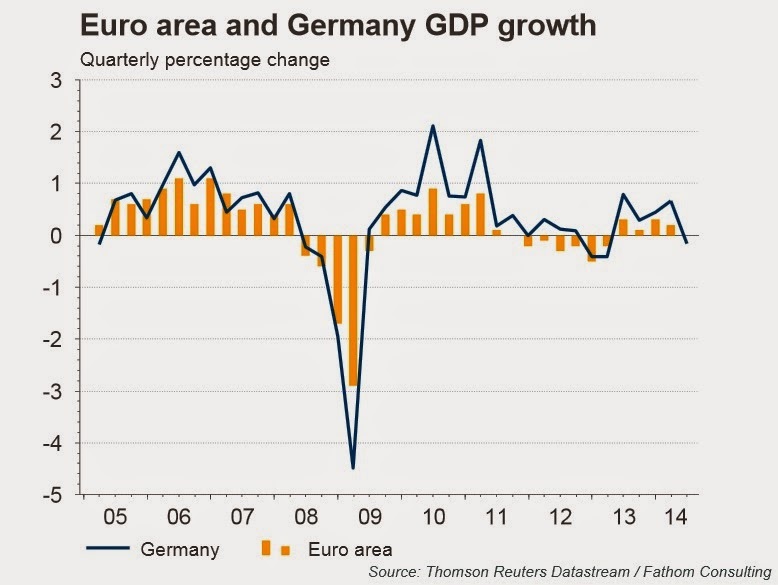 A wealth of data suggests that the eurozone already has one foot in recession. Hans Redeker from Morgan Stanley said the 5pc-6pc fall the Chinese yuan against the euro in the first half of the year is undercutting southern Europe. Portugal and Italy – among others, with Spain a borderline case – have a great number of small companies in textiles, shoes, furniture, tiles, and increasingly electrical goods, machinery, and telecommunications that compete toe-to-toe with China. They are famously “fishing in the same pool”, mostly mid-tier technology. The complementary index for European and Chinese exports shows that the EU is in direct competition with China on 35pc of 5,775 types of goods covered, up from 15 per cent in 2000. Germany is hit too, of course. Its solar industry has been largely wiped out by cheap Chinese copies. But it is southern Europe that is suffering the worst damage. If China and Europe were to slow, what would the effect be on America? Can the US decouple? This is where my opinion departs from David Levy. While Levy believes that weakness in Europe and China is likely to pull the US into recession, I believe that the American economy is somewhat insulated from a slowdown overseas because of the relatively weak trade linkages. However, the American stock market is not well insulated from a non-US growth pause because of the high degree of foreign exposure seen in large cap multi-national companies. So what happens if global growth started to slow? What would happen to large cap earnings growth? I had this scenario in the back of head when I observed that commodities and European stock markets were struggling (see Global growth scare = Trend Model downgrade). While European markets have started to recover somewhat, commodity prices remain under pressure and we are not out of the woods yet. Given the kind of macro downside risk, the consequences of a policy mistake is heightened. What is the effect of the ECB TLTRO program on the eurozone economy and financial system? How will peripheral bond risk premiums react? Is the European consensus shifting away from the all-austerity-all-the-time viewÉ How will European stock prices, which are a component of my Trend Model, react to these initiatives? Were the China July figures indicating a slowdown a blip, or the start of a new trend? The chart below shows the relative performance of the stock markets of Greater China, which consist of China (FXI in red), Hong Kong (EWH in black), Taiwan (EWT in green) and South Korea (EWY in orange) relative to ACWI. Is the recent episode of outperformance the start of a rally, or will these markets roll over as evidence of the ephemeral nature of the rebound emerge? How will commodity prices, another key real-time indicator of Chinese growth, react? 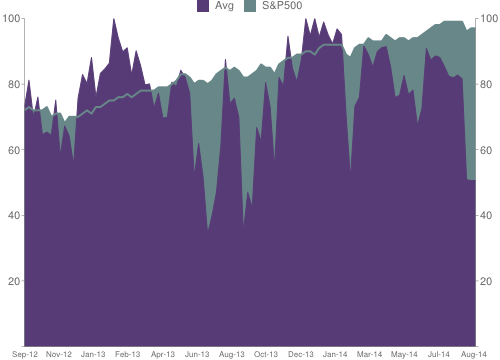 Most importantly, how are the Street's consensus SP 500 EPS estimates evolving? 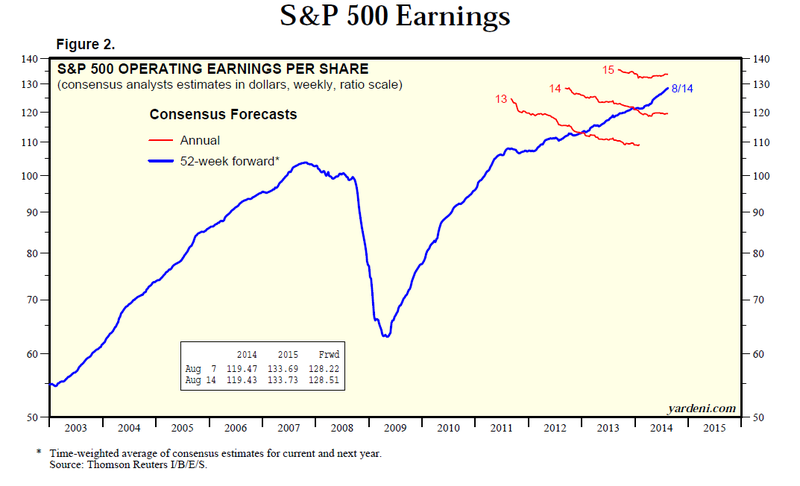 On the last question, Ed Yardeni's analysis showed that consensus EPS estimates continue to rise, which is a relief for the bulls. So far so good and I remain cautiously optimistic. However, these three tripwires bear watching as they could warn of the start of either a serious correction or the start of a bearish impulse in US equities. In retrospect, calling the bottom two weeks ago was relatively easy (see A tradable bottom?). Signs of panic was evident and the stock market had become oversold. The historical experience of the last two years showed that these kinds of rebounds have lasted roughly two weeks. Last week, I wrote that the SP 500 was forming an inverse head and shoulders pattern, with an upside target of 1985 (see Onwards and upwards). Given these kinds of short-term overbought conditions, my base case scenarios calls for either choppy sideways market action for the next week or so, or a minor pullback to begin. Should the market see a hiccup, the logical first support level for the SPX would be roughly 1960, which is the intersection of the 38.2% Fibonacci retracement and the 50 day moving average. Bear in mind, however, that 1960 represents only a 1.4% pullback from Friday's closing levels for the SPX. Worried about a 1.4% market squiggle? For swing traders, a potential 1.4% pullback is a playable scenario. For the vast majority of investors, a 1.4% squiggle in the stock market is something to be ignored. On an intermediate term basis, the technical rebound that began two weeks ago appears to be intact and my Trend Model readings remains firmly bullish. Market conditions were highly oversold and washed out two weeks ago and, if history is any guide, rebounds from such readings tend to go much further. In other words, we need sentiment readings to move from extreme fear to greed - and that hasn't happened yet. Consider, for example, my favorite overbought-oversold indicator, which is shown in green in the chart below. I am looking for this indicator to move back up to the shaded target zone, where past oversold rallies have petered out in the past. As well, the chart below shows the history of the term structure of the VIX (middle panel) and the VIX Index (bottom panel). After the kinds of panic conditions observed two weeks ago, I would look for the term structure to fall further to more complacent levels in the target zone. 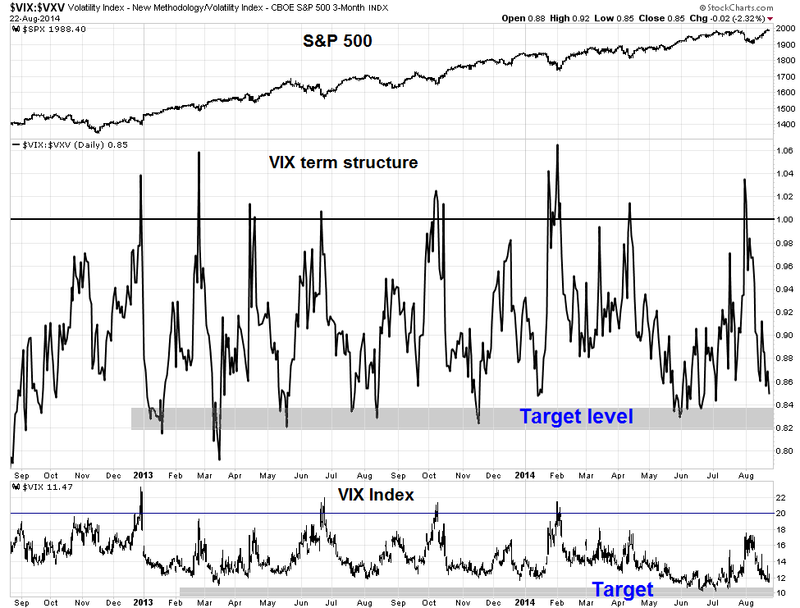 Similarly, I am watching for the VIX Index to descend further to a reading with a 10-handle. 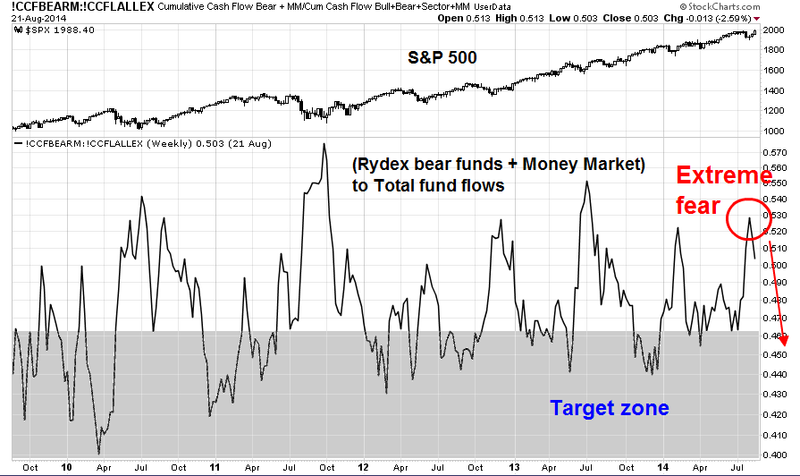 I am also watching the chart below of the Rydex fund flows of bear funds + money market funds as a % of total Rydex flows. After the extreme fear readings seen two weeks ago, I would watch for readings to normalize and fall to more bullish readings in the target zone. The weekly report of insider transaction from Barron's tells a similar story. While insider activity have moved into "neutral" territory from a "buy" signal, readings are nowhere in "sell" territory. For now, the intermediate trend in my Trend Model remains bullishly oriented and I will stay that way until the readings change. My base case scenario therefore calls for a week of choppy consolidation or weakness, to be followed by further rallies to new all-time highs. After that, my technical analysis crystal ball gets a bit cloudy. While my outlook is tilted bullishly, I will write a further post tomorrow detailing my macro concerns about the health of the US equity bull. You can also follow any updates that I might have on Twitter at @humblestudent, or subscribe to my blog post updates by email here. I have written about this topic before (see He who solves this puzzle shall be King), but in his weekly commentary, John Mauldin wrote about developing bubbles. 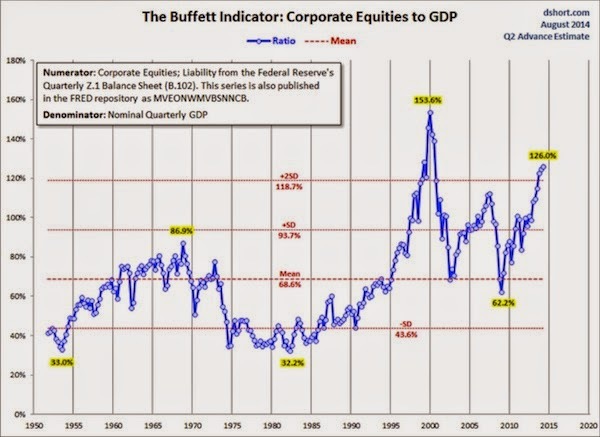 Mauldin referenced the following chart (from Doug Short) of market cap to GDP as Warren Buffett's favorite valuation metric to show that stock market valuations are stretched. I have called this same indicator as Buffett's favorite valuation metric before. However, I have not seen him publicly reference this ratio in interviews in the last 10 years. I am therefore re-considering the validity of this valuation measure. The market cap to GDP ratio is really shorthand for an aggregate price to sales ratio. Recall that the price to earnings ratio is price to sales divided by net margin - and corporate net margins have risen considerably over the past few years and created distortions in both the P/E and P/S ratios. 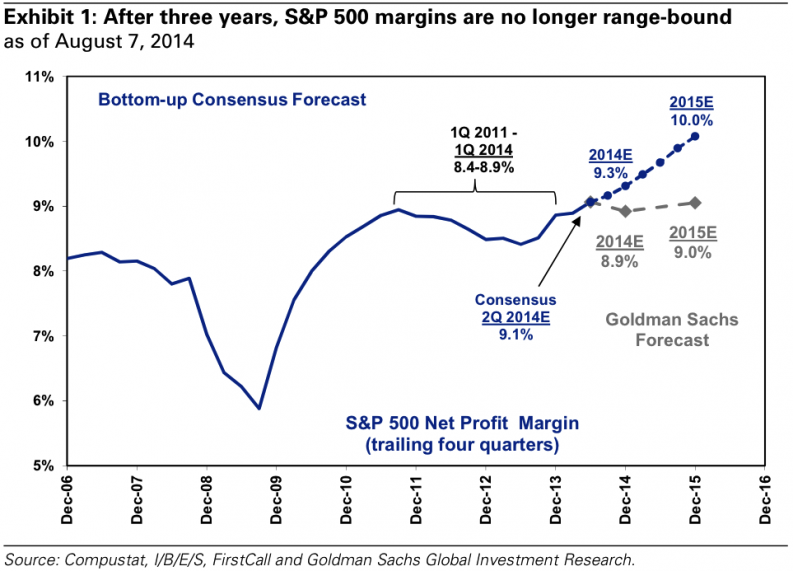 This chart from Goldman Sachs (via Business Insider) shows how corporate net margins have reached new highs. 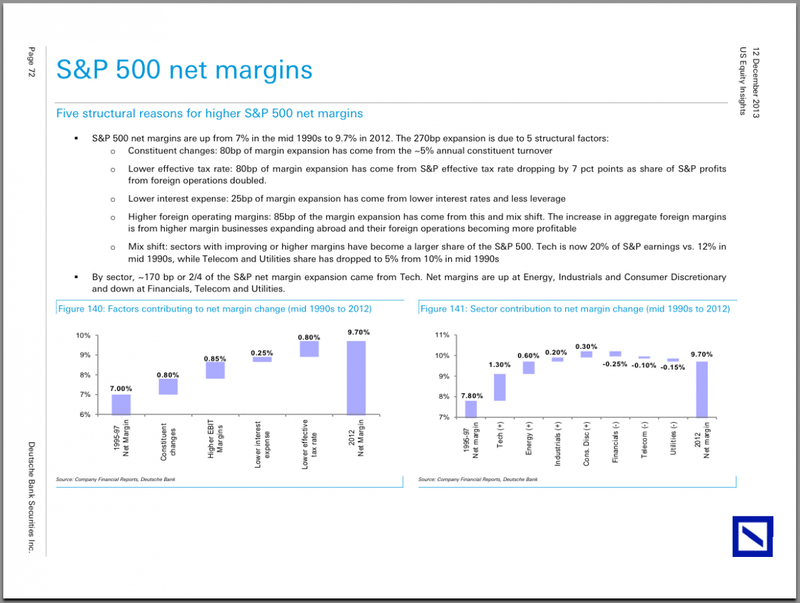 The rapid expansion in net margins suggests that they are at risk of mean reverting and falling at some point in the future. However, analysts like Dan Suzuki of BoAML have shown before that net margins have mainly been rising for financial reasons, namely lower interest expense and lower tax rates, rather than an increase in operating margins (via Business Insider). 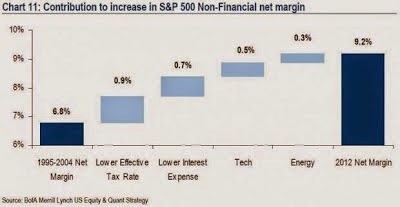 So, if P/E = P/S/(Net margins), then how valid is the price to sales metric if net margins are distorted by these factors? This analysis doesn't mean that equity valuations aren't stretched. I wrote before that stock prices appear to be elevated based on a combination of PE, PB and dividend yield (see More evidence of a low-return equity outlook). However, price to sales may have outlived its usefulness as a valuation metric given the current net margin environment and, by extension, to call market cap to GDP Warren Buffett`s favorite valuation indicator may be a label that`s well past its "best use" date. In case you missed it, the USD Index staged an upside breakout today. I have heard and read comments to the effect that you would have to be insane to lend the US Treasury money at 2.4% for 10 years. With inflation, depending on how you measure it, at or slightly below 2%, it implies a real yield of 0.4-0.7%. While that view has validity, you also have to consider the alternatives in "safe" asset yields. Today, the 10-year Bund yields is 1.0% and US Treasuries represent a 1.4% spread over Bunds! Not only that, Spanish 10-year yields are at roughly the same 2.4% level and Italian yields are only slightly higher at 2.6%! UK 10-year yields are also at about 2.4%. In that context, US Dollar assets are not expensive. The rally in the USD is no doubt partly a reflection of demand for USD assets, with Treasury paper a prime beneficiary of this trend, which is bullish for the prices of US Treasury paper. Not perhaps coincidentally, J. C. Parets wrote a post called The problem I see with silver, in which he detailed the technical difficulties that he saw with the silver price. 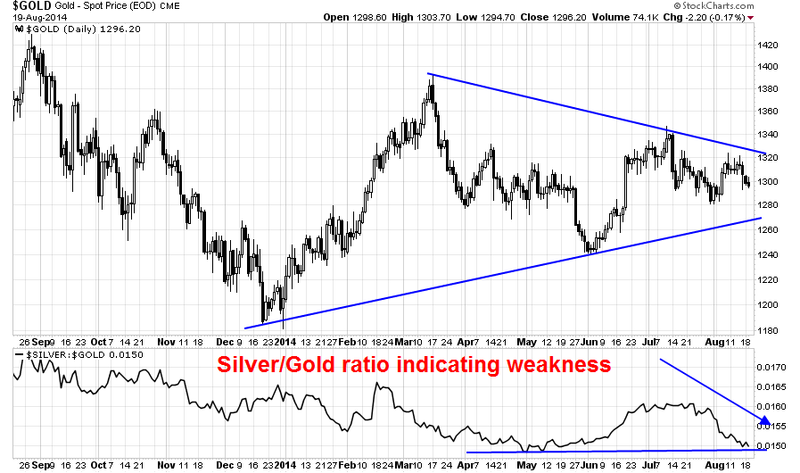 Any problems with silver are likely to extend to gold. The price of gold is also emblematic of the headwinds facing the commodity complex if the USD were to continue to rise, as commodities and the USD tend to be inversely correlated. I would agree with Parets assessment of the silver outlook and add that the silver-gold relationship is flashing warning signs for gold itself. As the top panel of the gold price chart shows, gold is showing a triangle wedge formation indicating indecision. An upside or downside breakout would indicate the next direction for gold. However, the bottom silver-gold ratio, which measures the more volatile silver price as a barometer for the precious metal complex, is showing weakness. The ratio is nearing a test of relative support. Should that support line break, it would have bearish implications for precious metals. Given the renewed strength in the USD, further weakness in gold, silver and other commodities is the more likely outcome. As technical analysts, we often overly focus on individual stocks or indices and forget the inter-connected nature of asset prices. This is just a little reminder of the importance of inter-market analysis. As the markets anticipate Janet Yellen's keynote speech at Jackson Hole entitled "Re-Evaluating Labor Market Dynamics", I came upon this Chicago Fed publication that might offer a sneak preview of what Yellen might have to say. Chicago Fed President Charles Evans is generally thought to be a dove and studies such as these provide more ammunition for Fed Chair Yellen to assert that you have to look beyond the headlines to assess labor market conditions. According to this Reuters report, "she'd rather fight inflation than another economic downturn" and this Chicago Fed publication is another step in that direction. 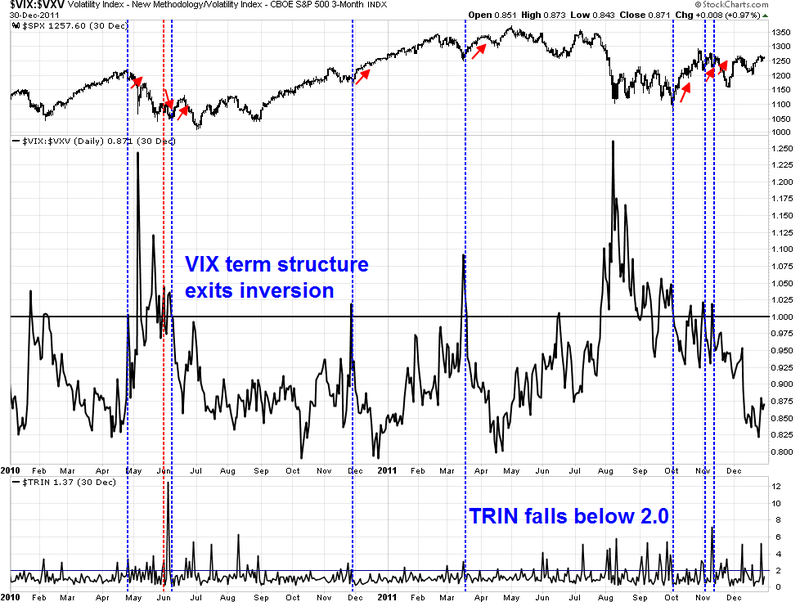 Last week, I showed this chart and pointed out that combination of the VIX term structure exiting inversion and TRIN falling from an 2.0 oversold condition was a powerful signal for an oversold rally (see A tradable bottom?). In the last two years, this combination has had a perfect record of calling bounces, which have lasted a minimum of two weeks. My opinion hasn't changed. I continue believe that the odds favor a continued rally to test the old highs seen in the SPX. Initially, I was somewhat concerned that both the slope of the term structure of the VIX and the VIX Index itself was falling very quickly. This was leading very quickly to a short-term overbought condition. 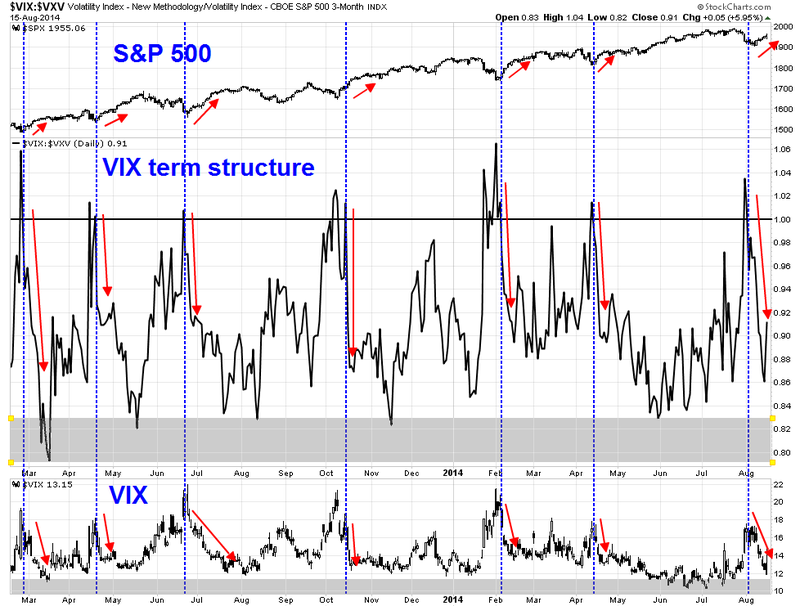 As the chart below shows, such behavior is typical of oversold rallies when the VIX term structure exits an inversion (dotted vertical lines) and bulls should not be concerned about the rapidity of the improvement in these indicators. Despite some technical concerns, such as the inability of the SP 500 to overcome its technical resistance at the 50 day moving average and the lagging performance of high-beta small cap stocks, the sentiment picture remains supportive of further advances. I have written that I tend to be somewhat skeptical of the results of sentiment surveys as sentiment readings can bounce around because they reflect opinions, rather than what people are actually doing with their money. I therefore tend to watch sentiment data that indicate how market participants are actually betting. 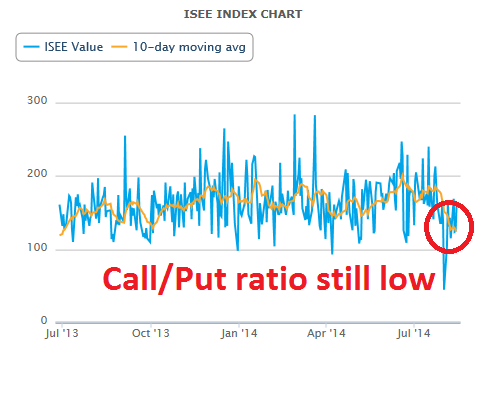 In this respect, the ISEE Index, which is a call-put ratio of opening customer option transactions, is a good reflection of short-term market sentiment. 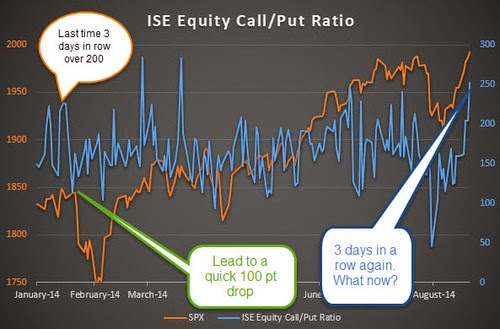 As the chart below shows, the equity-only ISEE Index remains low by historical standards, indicating few bullish call buyers, which is contrarian bullish. As well, it seems that institutional investors have panicked as stock prices tanked the the past few weeks. I was initially skeptical of the NAAIM readings and questioned the sampling techniques and methodology of the survey. 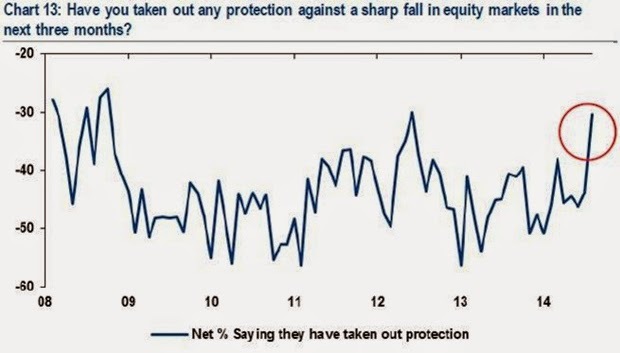 The chart below shows that the equity exposure of NAAIM institutional investors collapsed two weeks ago and they remained low in the latest weekly survey results. These readings were confirmed by the results of the BoAML Fund Manager survey, which showed that cash holdings spiked from 4.6% to 5.1% last month and fund managers had rushed to buy tail-risk protection for their portfolios. The weight of the evidence therefore suggests that market participants have already panicked. Bear markets and deep corrective market action generally do not start with sentiment readings at such bearish levels. Barring some catastrophic event, I expect the oversold rally to continue for at least another week, when we can look forward to possible hints of new directions in Federal Reserve policy at the annual Jackson Hole meeting. From a short-term technical perspective, the SPX appears to have staged an upside breakout from an inverse head and shoulders (IHS) formation. The Ukraine tension related pullback Friday saw the index retreat to successfully test the neckline of the breakout. The measured target of the IHS is 1985, which is roughly a test of the old highs in the index. "Lack of a bear case for stocks"
Should I be correct and the SPX rallies to the 1985 target or test the all-time highs, what happens next? The analysts, in a report published Monday, say the top of the market is defined by hubris and debt, and argue neither is present at the moment. Instead, it’s hard to argue that costs — whether as capital spending, inventory or hiring — are rising enough yet to be a threat to profit levels, they say. They’re back to bullish view in the wake of the market’s recent pullback, after having gone to “balanced” on a 12-month forward view last month. The analysts say stock-market valuations could still expand strongly because the economy is improving, real yields are higher (and inflation is low), and Fed policy is still accommodative. As a way to describe the economy, Goldilocks was formulated back in the 1990s, when the Fed was relatively well behaved and the economy was expanding. Today, I call it "Goldilocks cubed" because we have what actually may be an accelerating economy, with the Fed and Treasury rates well-behaved and perceptions about risk declining. Market valuations depend on growth, bond rates, and perceptions of risk, and all three of those are going in the direction that actually expands the price/earnings multiple. At the same time, earnings are expanding, and that's a recipe for another leg up in the market. In terms of economic expansion, we have been stuck in this 2% growth range since 2008-09. But we think something has happened and that animal spirits have returned. We've had these sky-is-falling moments, and every time we get through one of them, more and more people come out of their caves and say, "Maybe the sky is not really going to fall." In other words, the stock market is in a sweet spot right now. Economic and EPS growth look good, the interest rate environment is benign and risk appetite is healthy. While my views are tilted bullishly, that does not mean that there is nothing but clear sailing ahead for stocks. The direction of change of the Trend Model is positive, which is bullish, but the absolute level of the reading remains in "risk off" territory, which brings up the possibility that the current rally is a counter-trend rally in a downtrend. I will detail some of my concerns for US equities in a later post this week and tweet any updates as I see them at @humblestudent. You can also subscribe to my blog posts by email here. Roche is correct. Active managers, even if they have a mandate to be fully invested, often hold 2-5% cash in their portfolio for liquidity purposes as it is operationally difficult to hold 0% cash. So imagine that if you are holding 5% cash and the market went up 1% - you just underperformed by 5 basis points because of your cash holdings. Accumulate that effect over over the years and it adds up. I also want to point out another effect on active performance, the influence of stock weights in the index. The SP 500 is an index of 500 stocks with different weights. The larger companies, such as AAPL and XOM, have larger weights by virtual of their size and the smaller ones have much smaller weights. Now imagine that you are an active stockpicker manager with an SP 500 mandate. You will hold a portfolio of 100 stocks. For the simplicity of this exercise, you will only pick stocks that are members of the index. With virtually all investment processes, statistically your portfolio will have a smaller capitalization profile than the index. Read that last italicized sentence over and think about it. If you threw darts to pick your stocks and then formed an equal-weighted portfolio, i.e. 100 stocks with 1% weights, you will tend to underweight the large caps (e.g. AAPL and XOM) and overweight the small caps within your universe. In fact, it would be difficult to construct a weighting methodology where you pick 100 random stocks out of 500 that would have a larger cap profile than the index. That's because, statistically, the larger cap names have only a 1 in 5 chance of being picked to be in the portfolio. I recognize that stock picking managers do not pick stocks randomly, but few stock picking managers have a systematic bias towards large cap stocks. 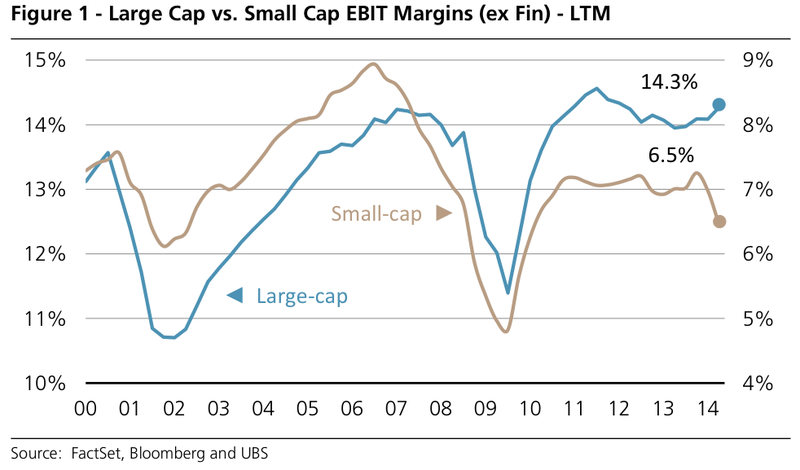 Here is the punch line: When large caps outperform, active managers will face headwinds in their returns. The chart below shows the relative performance of the equal-weighted SP 500 compared to the SP 500. When the line is rising and steep, active managers will tend to perform better. When the line is falling, they do much worse than the index. Savita Subramanian of BoAML (via Josh Brown) recently noted that only 27% of core managers beat their benchmark on a YTD basis. You will note that in the above chart, the equal weighted to cap weighted relative performance chart flattened out. When viewed in that context, along with the cash drag headwinds cited by Cullen Roche, it puts the performance of active managers into context. As promised, further to my recent post where I indicated that I would write about some bullish ideas (see A tradable bottom? ), here are three eclectic and out-of-the-box trade ideas for bulls. Each of them embody a different investment theme and each has different risk profiles and time horizons. In a recent note to shareholders Iben drew a comparison between one of the finest contrarian investors of all time, the late John Templeton, dove into a battered Japanese stock market in the 1960s (when stocks were trading at low single digit PE ratios) and the opportunity Iben sees today in Russia. Yeah. So this is – first of all, it’s a huge company. Revenues of $150 billion. The market cap is immense. They earn a lot of money even after, as my friend (inaudible) even after stealing they earn a lot of money. They pay a 5 percent dividend. As recently as 2006, the stock changed hands at 10 times the estimated earnings. So now it’s at 2.5. And why is that? Well, because people know that there will be even more extreme and costly sanctions imposed on Russia. They know that something terrible is going to happen with the Ukraine election in a couple of weeks. And well it might. There is certitude about outcomes that is notable given that so few people saw the current set of outcomes approaching some months ago. So in addition to the epigram that good things happen to cheap stocks, I will offer this epigram. This too will pass. "Here’s a test of suitability for this investment," said Grant. "You can’t care about the time." From a technical viewpoint, this chart below of the Russia ETF (RSX) appears to be trying to make a bottom. Even though the eruption of the latest round of geopolitical tensions, RSX failed to make a lower low. 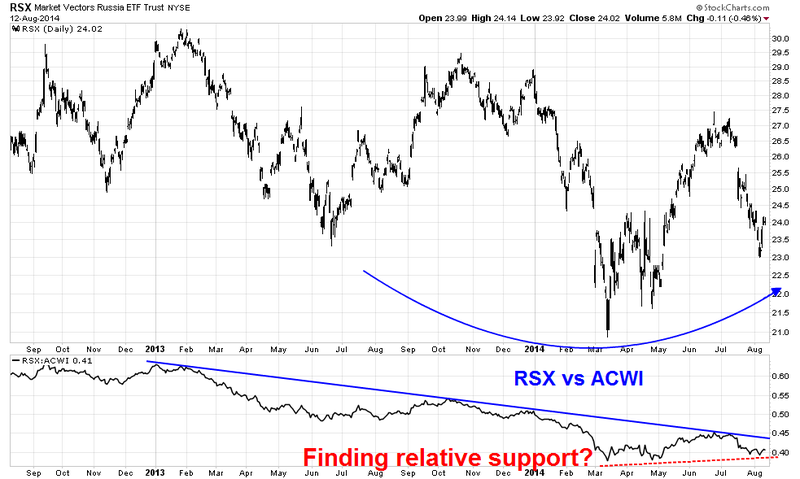 The relative performance chart of RSX to ACWI (MSCI All-Country World Index ETF) in the bottom panel shows that RSX remains in a relative downtrend, though it does seem to be finding relative support - which is positive. An entry point for the Druckenmiller AMZN-IBM pair? Stan Druckenmiller, who has one of the best track records in the hedge-fund industry over the past three decades, said he’s betting against the shares of International Business Machines Corp. (IBM) because the company’s business will be replaced by technology such as cloud computing. Druckenmiller said he is betting on Amazon.com Inc. (AMZN), and praised CEO Jeff Bezos. Amazon’s Web Services division, whose server farms generate the processing power the retailer sells to heavy corporate data users on the cheap, “is killing it,” he said. IBM should be investing in its business and taking on the “challenge of the Amazons of the world” instead of doing share buybacks, according to Druckenmiller. “I think he’s a serial monopolist,” Druckenmiller said of Amazon’s Bezos. While Druckenmiller did not specifically describe a long AMZN-short IBM position as a pair trade, I chose to interpret it that way and the pair chart is shown below. At the time of the article, the pair trade was somewhat extended in favor of AMZN. Since then, the pair has come back down to earth a bit and current levels could serve as a good entry point. I have written before that my research has shown that in a bull phase, traders are best served by buying the hot industries and sectors showing the best price momentum (see Momentum + Bull market = Chocolate + Peanut butter). On the weekend, I called for an oversold rally to start (see A tradable bottom?). In such an instance, the highest beta momentum group to play appears to be the semiconductor stocks. As the chart below of the relative performance of SOX to SPX shows, the semiconductor stocks have been displaying leadership qualities for all of 2014. The recent retreat, which was due to the minor pullback that we saw in the last couple of weeks, shows the group to have come down to a reasonable long entry point for traders to want to play the momentum game. I want to repeat my previous caveat that these are all different kinds of trade ideas encompassing different investment themes, different time horizons and different levels of risk. Not all ideas are suitable for everyone. While I have no positions in any of these trades at the moment, I could initiate a position at any time. Further, I know nothing about your portfolio or your risk tolerance. Do your own due diligence before putting on any of these positions. In this study, Geanakoplos et al related demography to long-term stock returns. They found that P/E ratios were correlated to the ratio of middle-aged people to young adults, otherwise known as the MY ratio. When MY rises, the market P/E will tend to rise and when it falls, P/Es tend to fall. If the conclusions of the study are correct, then we should see a continued fall in P/E ratios with a long-term bottom in stock prices forming about 2018, or eight years from now. In 2012, I followed up with a post about a San Francisco Fed study entitled Boomer Retirement: Headwinds for U.S. Equity Markets? The SF Fed researchers used a slightly different methodology than the paper by Geanakoplos et al, and they postulated a market bottom in 2021 (see A stock market bottom at the end of this decade). McBride argues that currently, with so many 20-24 year olds, the demographics are very favorable to apartment renting. 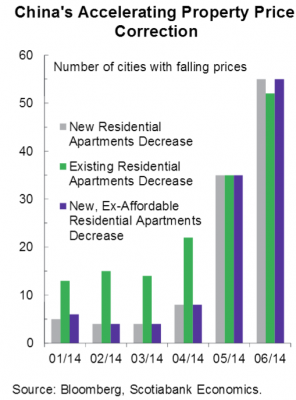 And so of course these days, the multi-family housing sector has been leading the way. And you hear all these stories about how people aren't into homeownership anymore. But the demographics that are currently favorable to apartments will turn into demographics favorable to homeownership, as the cohort gets older, moves into higher paying jobs, and wants more space for those new babies. Bottom line: As the Echo Boomers age, they get more affluent, start to have babies and they will drive a bull market in housing, as well as the stock market. It`s nice to get confirmation of my demographically driven analysis from an well-respected source. The Trend Models are somewhat confusing this week, as the intermediate term Trend Model flipped from risk-on to risk-off, which is a downgrade, but the trading model, or direction of last change, moved to an unconfirmed positive. The obvious question is, "If the intermediate term model goes from 'risk-on' to 'risk-off', shouldn't the direction of last change be 'negative' instead of positive?" That's because the signals have been moving around so quickly last week as the signal flipped from negative early in the week to an unconfirmed positive on Friday. These volatile conditions heighten the risk of performance whipsaw. Let me explain how the modeling process works. Further to the post showing the promising returns of the Trend Model (see Trend Model report card: July 2014), I was asked, "How systematic or discretionary are the trading decisions?" Trend Model signals are primarily based on the application of a highly systematic trend-following model, which uses crossing moving averages, on commodity prices and global equity prices. The details are of which moving averages, which commodities and indices and their weights are proprietary, but the conclusions are more of less the same no matter how you look at the global picture. However, trend-following models have two weaknesses (not bugs, but "features"). They tend to be late in calling tops and bottoms and, if there is no trend, their signals are subject to whipsaw which detract from performance. To address some of these weaknesses, I have relied on a series of sentiment based indicators to better time entry and exit points. These sentiment models primarily focus on measures of sentiment from option data, largely because the option market is reflective of what people are doing with their money rather than sentiment surveys where people express opinions which may or may not be acted upon. I also cross-check the conclusions from the option data models with overbought-oversold indicators. 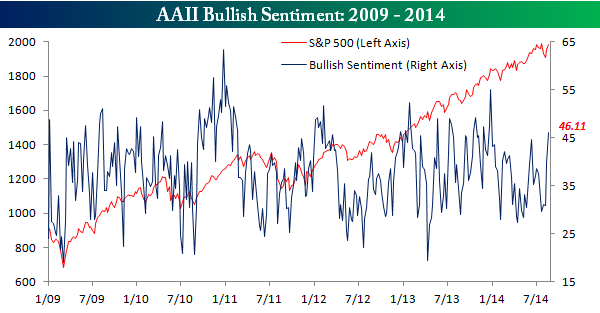 These short-term sentiment based indicators tend to used more for risk control purposes. Here is an example of how the two components interact with each other. If the trend-following model is flashing a buy signal and the markets are in an uptrend, but the sentiment models are showing a crowded long and an extremely overbought condition, I would be inclined to either lower my long position, move to cash, or perhaps take a very small short position in anticipation of a pullback. So in answer to the question of how systematic or discretionary are the trading decisions, the signals of both of trend-following components and the short-term sentiment indicators are systematic, but their interpretation is somewhat discretionary. Let's consider what each of the components are saying now. From an intermediate term perspective, the trend following components of the models are screaming "risk-off". Consider, for example, this chart of the SP 500. While the SPX remains above its 200 day moving average (dma), it decisively broke down below its 50 dma. At best, the SPX can be ranked as "neutral". The technical conditions of the European markets look far worse. This chart of the STOXX 600 shows that it has not only violated the 50 dma, but the 200 dma as well. It seems to be selling off with no sign of stabilization in sight. The Trend Model was built to analyze markets from a global perspective. The three trading blocs and engines of growth in the world today are the US, Europe and China. While US and European equity market indices tell a great deal about these economies, the Chinese equity market is far less developed and less liquid than any of the major developed market indices. To get a read on China, I rely more on commodity prices. 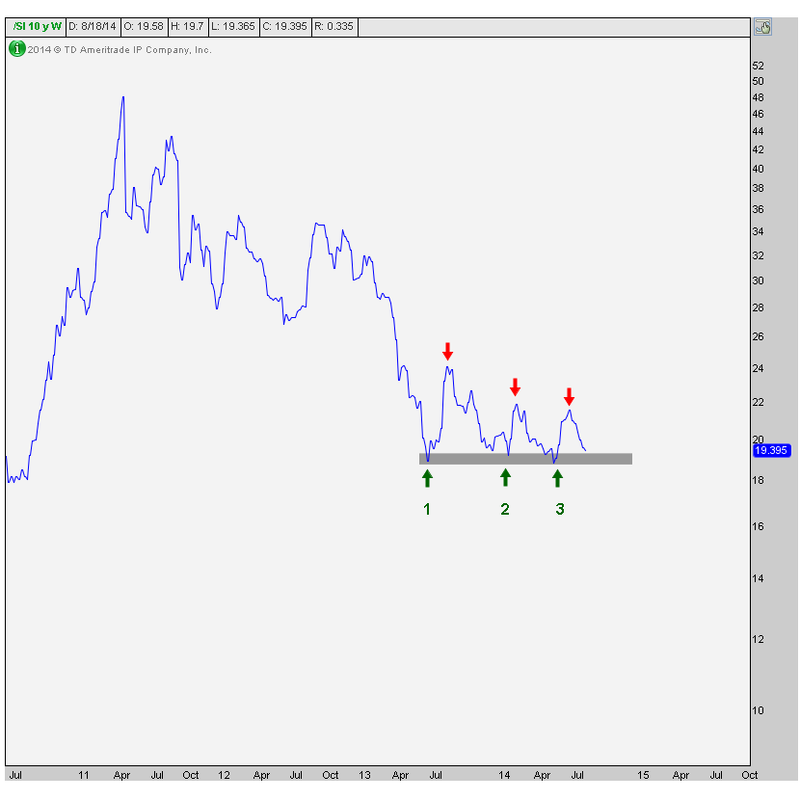 This chart of the CRB Index shows that commodity prices to be in a downtrend. 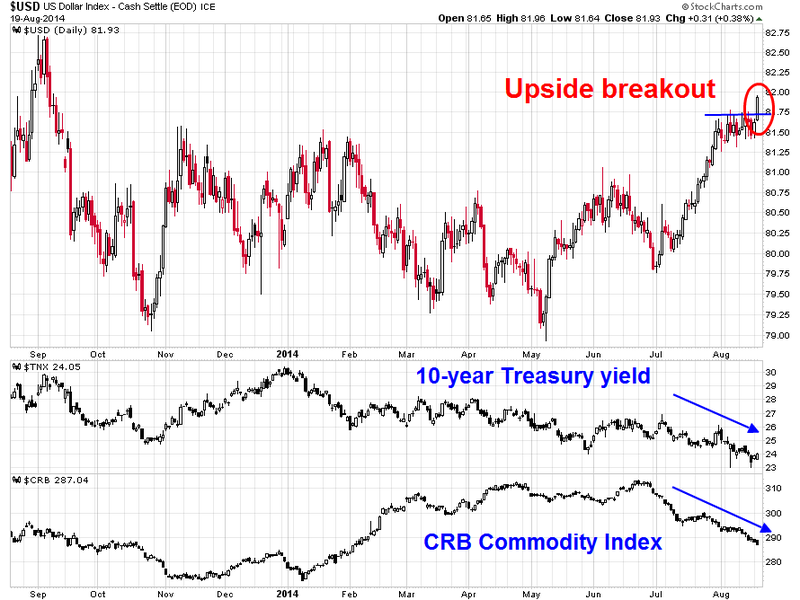 The equal-weighted CRB Index, or CCI, looks even worse than the CRB. That's largely because of the downdraft we are seeing in the agricultural complex. When you put it all together, the intermediate term picture looks dire. It was the weakness in foreign equity and commodity markets that led me to issue a warning about US equities (see Global growth scare = Trend Model downgrade). The short-term sentiment-based models, however, tell a different story. In the last week, sentiment model readings have been volatile. In the previous week, I had postulated that US equities would see an oversold rally based on what I saw in the VIX term structure (see Still bearish, but watch for the dead-cat bounce). We saw a minor bounce on Monday, but there was little or no follow through. I re-thought my analysis and consider the possibility that we could be seeing the start of a deeper pullback (see Bounce is over, time to get bearish). The scenario would be that we were on the verge of a deeper sell-off into a capitulation low. The sell-off occurred overnight, but when the market opened on Friday morning, an oversold rally had begun. 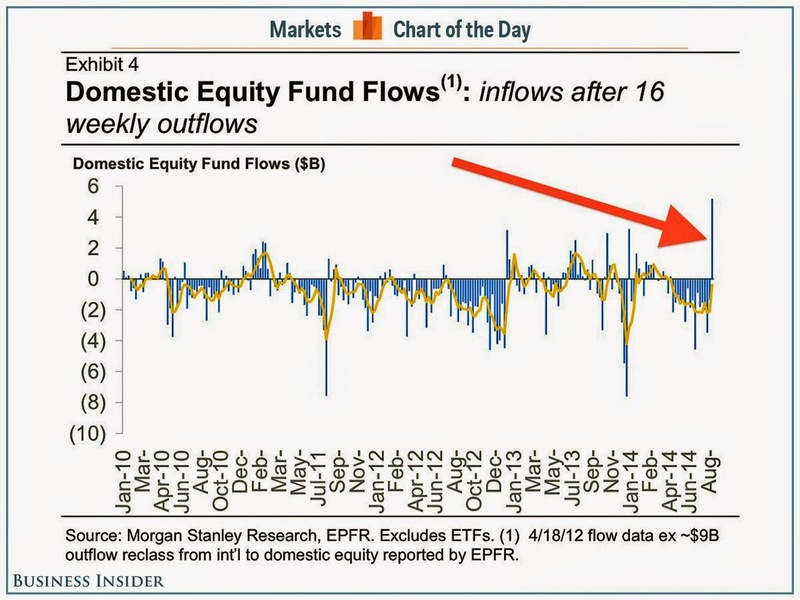 The "capitulation sell-off" was over if you blinked (or slept through it). Today, technical conditions are pointing to a tradable bottom in US equities. 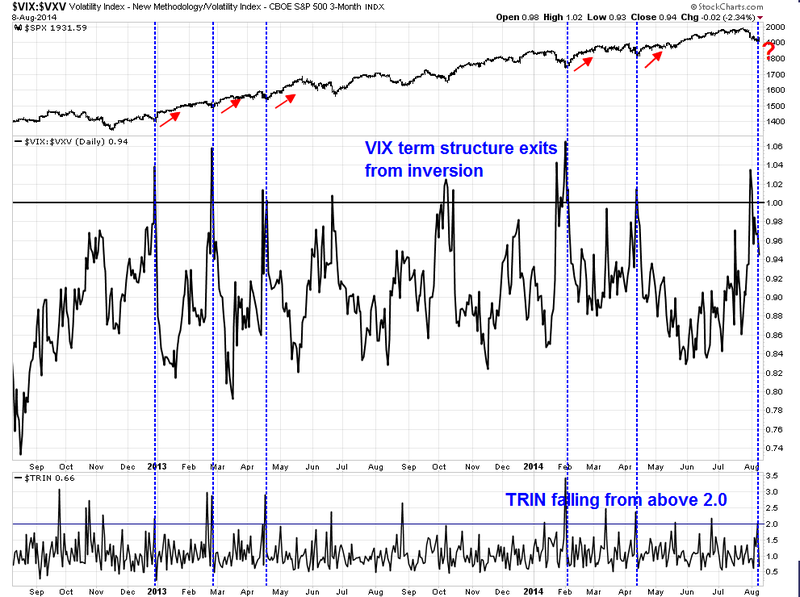 My research has found that whenever the VIX term structure exited inversion, it has shown to be fairly reliable buy signals, and whenever the TRIN Index rose above 2.0 (oversold) and then fell below that level, it has also indicated profitable long entry points. Both systems have flashed false positives. What is remarkable is the combination of these two indicators (marked by dotted vertical lines on the chart below) has had an infallible record of calling tradable bottoms in the last two years.During that period, ensuing rallies have lasted a minimum of two weeks. The track record of this system in the 2010-2011 period, which had more up-and-down markets, has also been very consistent. I have marked the instances where this combination of two indicators successfully marked a tradable bottom in blue and unsuccessfully in red. During this more volatile period, however, "buy" signals generated by this system generally saw rallies that lasted a minimum of one week, instead of the two weeks that we have seen in the last couple of years. As well, whenever my favorite overbought-oversold indicator, which is based on the ratio of stocks above their 50 dma to stocks above their 150 dma, exits from the 0.50 oversold reading, which it did this week, stock prices have tended to rebound. At the end of the week, the volatile market action left me in somewhat of a quandary. The trend-following models are calling for risk-off, while the short-term sentiment model readings are bouncing all over the place. This left me calling for an unconfirmed risk-on trading signal. At the time of this writing on Sunday night, ES futures are modestly in the green, which raises the odds of bullish confirmation. Nevertheless, I would like to see some bullish follow-through next week before committing to a full risk-on reading on my trading account. If readers would like to see the real-time developments of how the signal develops, please follow me on Twitter at @humblestudent. I will be tweeting during the week and try to post updates on this blog, which you can subscribe to with email updates (with a delivery delay) here. The interest rate environment continues to be benign. Interest rates matter because they affect the discount rate on earnings, or the inverse of the PE ratio. With 10-year Treasury yields at 2.4%, what is there to complain about? We have seen solid reports from the current Earnings Season. The earnings beat rate has been between 67% and 73%, depending which sample you are looking at, and the revenue beat rate has also been above the historical average. Analysis from Factset indicating that the market was not rewarding earnings beats but punishing misses is more of a comment on market psychology than market fundamentals. However, Brian Gilmartin reports that "The year-over-year (y/y) growth rate of the forward estimate fell to 9.53%, from last week’s 9.58%", which is a possible concern that growth expectations are coming down and this development needs to be watched. Growth for the rest of 2014, and early 2015, looks intact. But weakness in the housing market evident in the first part of this year may be spreading into the rest of the economy, suggesting that growth will slow down. Plain and simple, they are shifting their allocations toward a world of faster economic growth and higher volatility. Not all at once, and not severely, but definitely. It’s happening. This explains the bludgeoning of the consumer staples sector last week – its worst sell-off since the late-May Taper Tantrum of 2013. Consumer staples are the perfect stocks for slow growth and low yields – as they offer consistency of earnings regardless of cyclicality and higher than average dividends. In a higher-rate, more pro-cyclical environment, they are not so perfect – especially given their current high valuation. And so they are under distribution so long as economic news – like last week’s record post-crisis ISM report – continue to roll out. Which brings me to the junk bond sell-off, another symptom of our awaking to the possibility of faster growth. It’s been a pretty orderly sell-off for the $1.6 trillion high yield market, but quite steady and relentless all the same. Why? In a higher rates environment – if ever such a thing should come about – investors are going to demand more return for the risks they’re taking in the asset class. Defaults have been almost non-existent, so the popularity of high yield bonds in investor asset allocations is perfectly understandable. But higher rates have a tendency of disturbing this placidity like a skipped stone across the surface of a pond. And so $5 billion has come out of high yield funds in July, including the highest one-week redemptions in more than a year. Once again, this is the Big Money preparing for something new. Now, you may be asking, why, if large groups of investors are preparing for higher rates, are rates actually declining – as evidenced by the near record-low yields we saw in the 10-year Treasury last week? This is a great question, I’m glad you asked. My theory is that the activity and jostling for position inherent in a market regime shift like the one we’re now seeing is guaranteed to cause volatility. Elephants cannot play musical chairs, even slowly, without some degree of breakage and collateral damage. Nor can large pools of invested capital switch themselves around in complete silence. Indeed, the junk bond and, its half-sister, EM bond markets have begun to roll over relative to Treasuries (see my post here about the proper performance benchmarks for bond ETFs). Is this move in the junk bond market a hiccup, or the start of something big? I’m open to other opinions, but for it to be something big, you have to have a lot of things that look misfinanced. Where are there economic entities with short-term debt financing long term assets that look overvalued? Where have debts grown the most? I can’t identify a class like that unless we try student loans, or government debts. Corporate debt has grown, but doesn’t seem unreasonable now. So, with high yield, I lean toward the hiccup. But even at current yields, it is not cheap. Speculators may play; I will stay away. To sum up, my inner investor is not overly worried. Equity market fundamentals look ok and the recent bout of risk aversion is only a hiccup. He is therefore looking around for interesting bargains. In a future post, I will write about a few out-of-the box opportunities that I see in this market. IMF's China: Blind men and the elephant?